The biggest problem faced by Texas Democrats is that too many Democrats don't vote because they have been fooled into thinking that their vote does not count. They have been convinced by the popular media that Texas is a RED state that Republicans will win because the state has more Republican than Democratic Voters. Democrats, don't believe the Republican propaganda. Texas is the only minority/majority state in the Union where Democrats are not winning statewide elections. If every voting aged person who rejects the Republican Party's platform agenda for Texas and America will register and vote in the coming election, President Obama will win Texas' 37 electoral college votes and Paul Sadler will be Texas' next U.S. Senator. 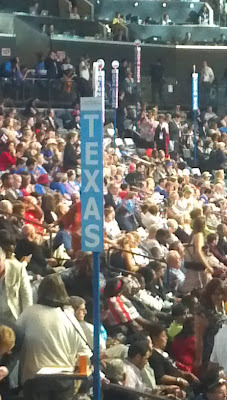 Do the addition - it adds up - Texas is a blue state by voting age population! Whoever wins in November will likely have the opportunity to appoint at least one and possibly up to three justices. And remember, it is the U.S. Senate that confirms the president's court appointments. 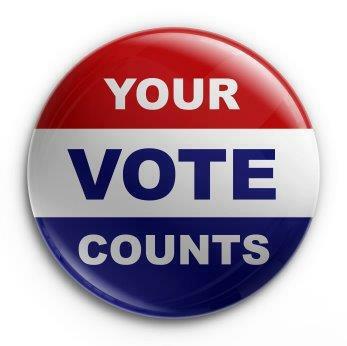 So think about that before you skip the U.S. Senate ballot position, when casting your vote. Are you a voting age person who believes every woman should have the right of privacy to make her own health care and family planning choices? If Romney wins, he will certainly nominate extremely conservative justices to appeal to the Tea Party elements within his party. President Romney would appoint conservative justices who support Justice Scalia's position that women have no constitutional right of privacy to choose to use contraception or choose to have an abortion, even when her life is at risk from a pregnancy. If you are a voting age Texan who rejects these Republican policy positions, then you must make sure you are registered to vote and vote a straight Democratic Ballot. Are you a voting age person who believes every child has the right to a quality education in an adequately funded public school system and who rejects the Republican position that our American school system should be privatized and corporatized with vouchers? If you are a voting age Texan who rejects this Republican policy position, then you make sure you are registered to vote and vote a straight Democratic Ballot. Are you a voting age person who believes that every American, particularly retired Americans who have spent a lifetime building a better America, have a right to life guaranteed by access to health care and who rejects the Republican policy position that the Affordable Care Act must be repealed and that Medicare and Medicaid should be privatized and corporatized with vouchers? If you are a voting age Texan who rejects these Republican policy position, then you must make sure you are registered to vote and vote a straight Democratic Ballot. And, by the way, don't believe the Republican lie that Medicare is going bankrupt - it's not. Polls That Include Cell Phone Only Voters Give Obama A Big Lead! Fox News released a new poll Thursday showing that President Barack Obama leads Mitt Romney in three battleground states, topping off a week of bad-news polling for the Republican presidential nominee in toss-up states. The poll, which covered Ohio, Virginia and Florida, shows Obama leading Romney by seven points in both Ohio (49 to 42 percent) and Virginia (50 to 43 percent). 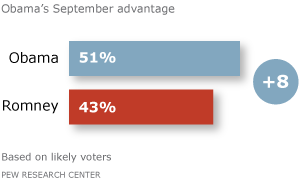 In Florida, Obama leads by five points (49 to 44 percent), which is within the poll's margin of error. Obama won all three states in 2008, marking the first time Virginia voted for a Democratic president since 1964. New York Times pollster Nate Silver notes that Obama tends to do better against Romney in polls that include cell phones and use live interviewers instead of automated questions. Silver writes that Obama has shown a clear lead in the 16 cell phone-inclusive polls of seven top battleground states taken since the convention. 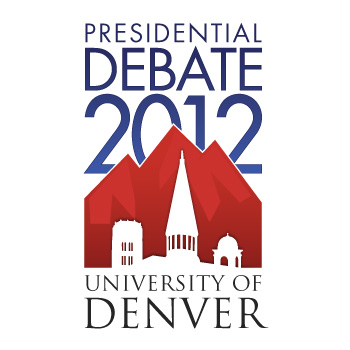 (The Fox, CNN and Marquette Law School polls all included cell phone respondents.) On average, Obama has a 5.8 percentage point lead in surveys that include properly weighted cell phone (only) respondents. 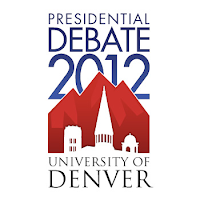 The latest national survey by the Pew Research Center for the People & the Press, conducted September 12-16, 2012 among 3,019 adults, including properly weighted cell phone only respondents, finds that Obama has an eight-point lead over Mitt Romney among likely voters on which candidate gets their vote. Not only does Obama enjoy a substantial lead on Pew's ballot preference question, he tops Romney in a number of other key categories, too. Obama continues to be the more likable candidate by a substantial margin; his favorability rating has risen to 55% from 50% in late July, with only 42% now expressing an unfavorable view of him. Pew Research Center leads other public polling organizations for polling expertise in our increasingly cell phone only society. The number of Americans who have no landline phone service, who rely solely or mostly on cell phone service, has been growing for several years. The cell phone only trend poses an increasing likelihood that public opinion polls conducted only or mostly to landline phone respondents have a conservative bias. Analysis by Pew Research Center in 2010 shows support for Republican candidates is significantly higher in polls calling only or mostly landline respondents, than in dual frame surveys that combined properly weighted landline and cell phone respondent polling. Pew Research found in 2010 up to a 10 point conservative bias gap between those who could be reached by landline and those who could be reached only by cell phone. Those who have gone cell phone only hold significantly more progressive / liberal political views than those who can still be polled by landline live or automated robo calls. 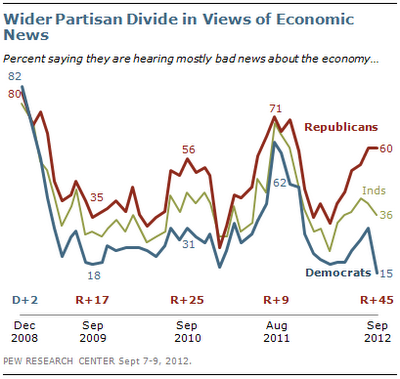 This gap has likely widened over the last two years. In a letter to the editor of the The Statesman, Texas Senator Rodney Ellis (D-13) explains the dead voter purge problem that tens of thousands of live voters may face when they go to vote, starting on October 22, 2012. 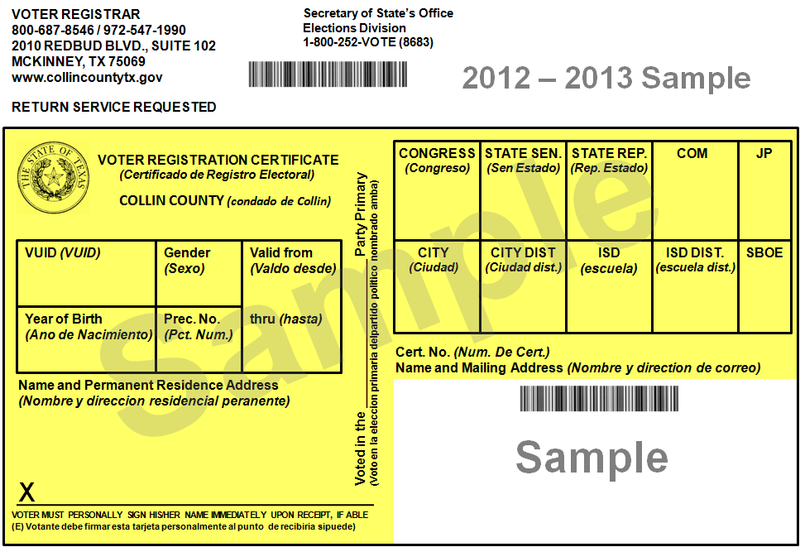 In the past week, thousands of voters across Texas opened their mailboxes to learn that they might be dead. It was quite a shock to many of them. This week, I began receiving calls from constituents who had received letters from Harris County voting officials stating the government had obtained information indicating they were deceased and, unless they responded to the letter within 30 days, their voter registration will be canceled. Thousands of such letters apparently have gone out across the state. 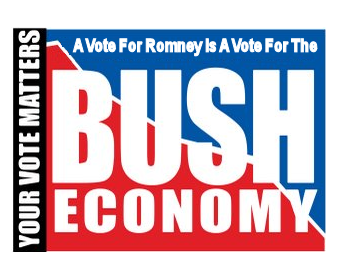 And the American people do remember all those conservative failures. As we approach the 2012 election, every indication is that we will see an unprecedented use of voter challenges in an effort to suppress minority voting. 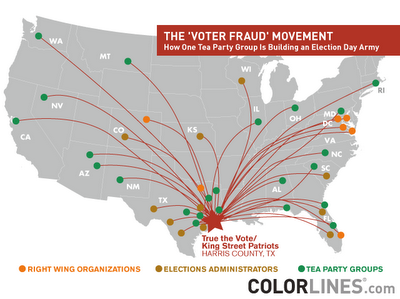 True the Vote is a tea party based organization that aims to recruit one million poll watchers around the country this November, to challenge minority voters under the color of protecting the electoral process against vote impersonation fraud — notwithstanding overwhelming factual evidence showing that in-person voting voter impersonation fraud is all but non-existent. True the Vote representatives say they want to make the experience of voting “like driving [while black, through a white suburbia neighborhood,] and seeing the police following you. Bullies at the Ballot Box, a new report released jointly by Demos and Common Cause, reviews election laws of ten battleground states — Colorado, Florida, Missouri, Nevada, New Hampshire, North Carolina, Ohio, Pennsylvania, Texas and Virginia — that might be exploited to suppress the vote. Thirty-nine states allow private citizens to challenge voters at the polls. Of the thirty-nine states where anyone can challenge voters' eligibility to vote inside polling places, only fifteen of them require the challengers to prove that the person they’re challenging isn’t an eligible voter. Which means that in twenty-four states poll watchers can wage all kinds of frivolous extralegal, but not necessarily illegal, mischief to exploit election laws, with accusations — that a voter is an “illegal alien,” or that they are using a dead person’s identity to vote — to burden if not intimidate voters and slow traffic flow through buy polling places. In states with "voter challenge" laws, the poll watcher's intended roll to guarantee fair elections can be abused and used for racial profiling for no other reason than having a Latino surname or dark skin color. In those states, people can make up a reason to challenge a voter’s rights without any evidence backing them up, and do so with impunity. A new report from the Brennan Center for Justice, “Voter Challengers” details that troublesome history while spelling out just how problematic such poll-watching activities can be, especially when administered by hyper-partisan and racially insensitive groups like True the Vote. True the Vote, and their many allies, often cite voter fraud as the reason for militarizing the polls, but countless studies have shown that their claims of massive in-person voting voter fraud are nothing more than lies, as detailed in this News 21 investigation. 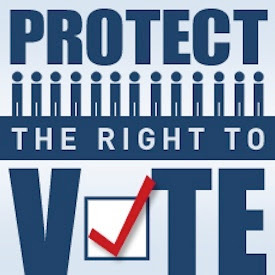 That creates a real danger that voters and election officials will face misguided and overzealous True the Vote poll greeter and poll watcher volunteers, who will take the law into their own hands to target minority voters and election officials — outside and inside polling places. While there are many issues that should be considered when casting a vote for a presidential candidate, perhaps the most important issue is the Supreme Court. A president's term lasts for a maximum of eight years; a Supreme Court justice's term can span more than 30 years. Three Supreme Court justices — Ruth Bader Ginsburg, Antonin Scalia and Anthony Kennedy — will reach their 80s during the next presidential administration. 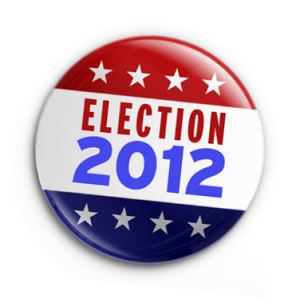 Whoever wins in November will likely have the opportunity to appoint at least one and possibly up to three justices. And remember, it is the U.S. Senate that confirms the president's court appointments. 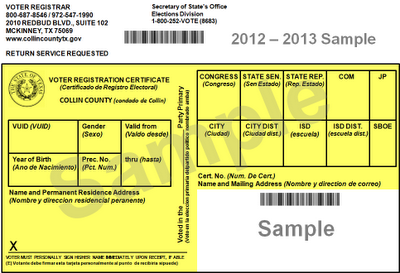 So think about that before you skip the U.S. Senate ballot position, when casting your vote. The average tenure of a Supreme Court justice today is 25 to 35 years — spanning more than six presidential terms. If the newest justice, Elena Kagan, serves for all of her current life expectancy, she will remain on the court until 2045. If extreme conservatives replace Justice Ginsburg and Justice Kennedy, the Supreme Court will have a solid 6-3 conservative to extremely conservative court advantage over progressive justices. Women in particularly should care whether Obama or Romney make lifetime appointments to the Supreme Court. Your right of privacy to make your own health care and family planning choices is at stake. If Romney wins, he will certainly nominate extremely conservative justices to appeal to the Tea Party elements within his party. President Romney would appoint conservative justices who support Justice Scalia's position that women have no constitutional right of privacy to choose to use contraception or choose to have an abortion, even when her life is at risk from a pregnancy. And the constitutionally of the Voting Rights Act at the hands of a solid 6-3 conservative to extreme conservative Supreme Court? Forget about it! 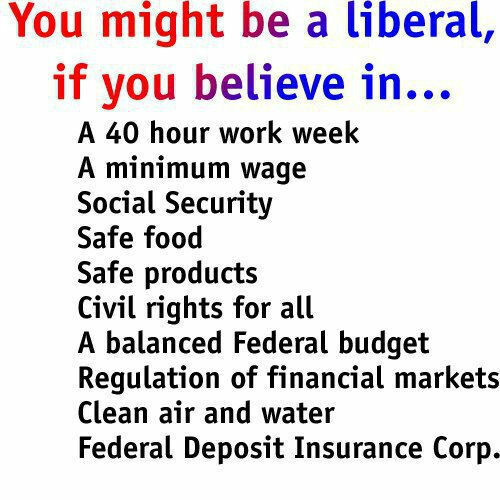 How about the rights of individual citizens compared to "corporations are people, too," rights? No contest. And that old Brown v. Board of Education court decision? Welcome back "separate but equal." The 1954 Brown v. Board of Education decision turned life upside down in this country as it outlawed segregation in public schools and provided a road map for the civil rights assault on other aspects of the racist status quo. 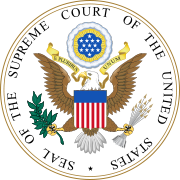 The 1965 Griswold v. Connecticut decision that women have a constitutional right of privacy to choose to learn about and use contraception is a fundamental cornerstone of women's rights. The decision on whether the bloody battles over social, reproductive and civil rights, fought more than a half century ago, are again thrust upon us hang on this election. 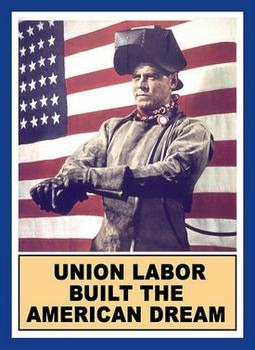 President Romney would without doubt appoint Supreme Court Justices who would turn back the clock to 1954! Fired Up! Ready to Go! The Texas delegation is headed home, armed with this go to phrase that embodied the final night of the DNC. 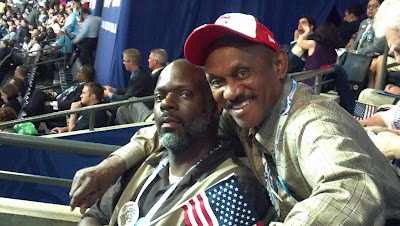 We experienced a night of high energy speakers, Hollywood A-listers and music stars as diverse as the national delegation gathered to support President Obama. And most inspiring of all, we heard President Obama's acceptance speech! The DNC reconvened with Marc Anthony singing the National Anthem and James Taylor performed the classic "Going to Carolina" prompting an arena wide sing along. Shortly after, Representatives Barney Frank, Debbie Wasserman Schultz and Los Angeles Mayor Antonio Villaragiosa addressed the crowd. Wasserman Schultz gave tearful testimony as a survivor of breast cancer and the significance of the Affordable Healthcare Act. Beau Biden, Attorney General of Delaware made the hearty motion to nominate his father, Vice President Joe Biden, to which the delegation gave a boisterous second and verbal vote to pass the motion. Actresses Kerry Washington and Scarlett Johansson followed a Rock the Vote style showing by the Foo Fighters. Veterans like myself noted the failure to recite the Pledge of Allegiance at the opening of the night's agenda. We were amazed at the appearance of former Representative Gabrielle Giffords assisted by Debbie Wasserman Schultz to center stage. Giffords led the arena in a joyful recitation of the Pledge of Allegiance, which brought many to tears. Also featured were Caroline Kennedy, native Texan actress Eva Longoria, Senator John Kerry and former Michigan Governor Jennifer Granholm, whose rowdy no holds barred speech whipped the crowd into a frenzied Democratic fervor. 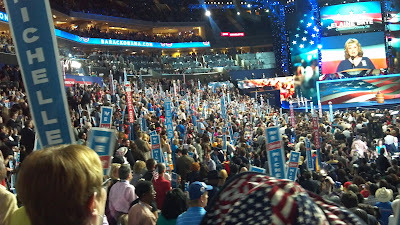 Dr. Jill Biden introduced Vice President Joe Biden, who accepted the nomination for VP. 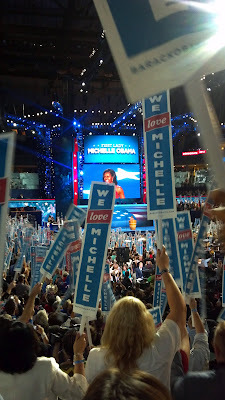 And of course the surprise second appearance of the First Lady Michelle Obama brought another chant of "We love Michelle" as she introduced our President Barrack Obama. The crowd shifted to chants of "Four More Years" as he stood, taking in the view of assembled supporters. We stood more than we sat for the duration of his speech as the President listed the numerous points of success in the last four years. A humble moment was felt when Obama quoted Abraham Lincoln saying "I have been driven many times to my knees by the overwhelming conviction that I had nowhere else to go,” promising to continue to do the work to lead our country. We returned to the host hotel enthralled and emboldened to return home fired up and ready to go, the mantra of Obama supporter Edith Childs. Even as I stand waiting to board my flight home, chants in the airport of Yes We Can abound. 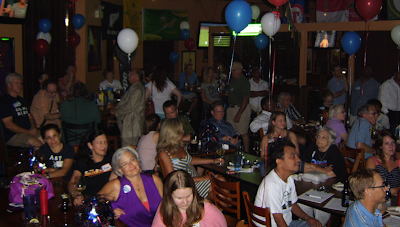 Editor's note: The picture right is of a group of about 60 people gathered for a Convention Watch Celebration at Rugby House Pub, in north west Plano, to hear President Obama's acceptance speech. The Democratic National Convention is getting started, and after a week of wild Republican nonsense last week, it's going to be wonderful to hear truthful speeches from our candidates and supporters. The pinnacle of the convention will be Thursday night, when President Barack Obama gives his acceptance speech. You'll want to be part of a cheering crowd of Democrats to share the energy and enthusiasm of what is sure to be one of the highlights of this campaign. We invite you to get "fired up and ready to go" for the rest of the campaign Thursday evening, September 6th at a Convention Watch Celebration at The Rugby House in north west Plano, near Preston and 121. Come whenever you like, beginning as early as 6, but keep in mind that President Obama will speak sometime in the 9:00 hour, so be sure to arrive in plenty of time so you have time to greet everyone, order and eat before the President speaks. The Rugby House has a diverse menu of excellent food at reasonable prices, and Happy Hour specials are extended till closing Thursday night. 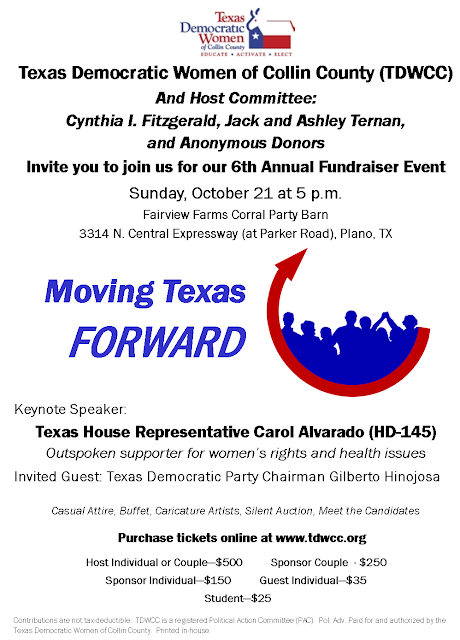 Thanks to Texas Democratic Women Collin County and Democratic Blog News for co-hosting this event, and individuals from Drinking Liberally in Plano and McKinney for helping to promote it. Similar events are being held at other locations, including private homes and at least one other restaurant in downtown Plano, Vickery Park. You can find details about all of the Convention Watch, phone banking and other events supporting the Obama campaign at www.BarackObama.com. Also, be sure to mark your calendars for our next Democratic Network Forum, Saturday morning, September 22nd, when we'll have a program on Voter Empowerment and Election Protection at the John & Judy Gay Library in south central McKinney. 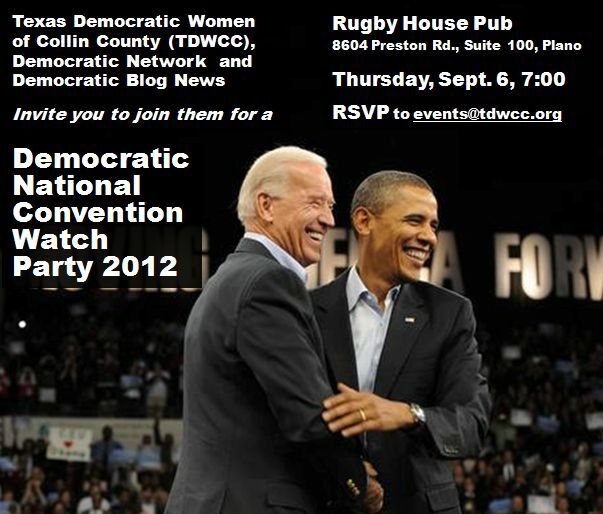 We'll send out more information soon, but hope you'll plan to attend and bring some Democratic friends with you. 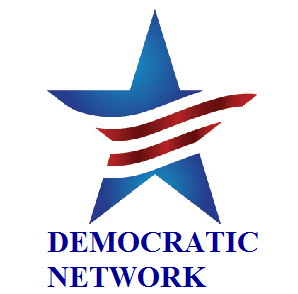 The Democratic Network offers opportunities for current and future Democratic activists to learn about the issues that affect us here in Collin County, and what we, as Democrats, can do to make things better. 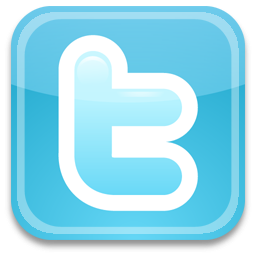 We invite your input on topics, speakers, format and other options - and encourage you to get involved in growing our network. 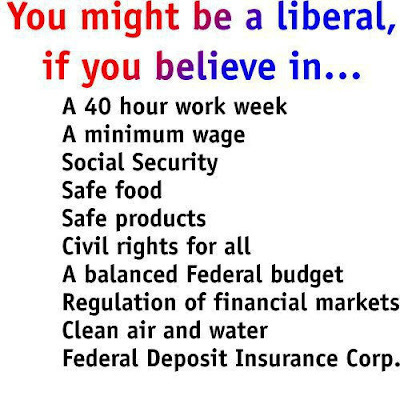 If you'd like to add Democrats you know to our distribution list, please let us know. 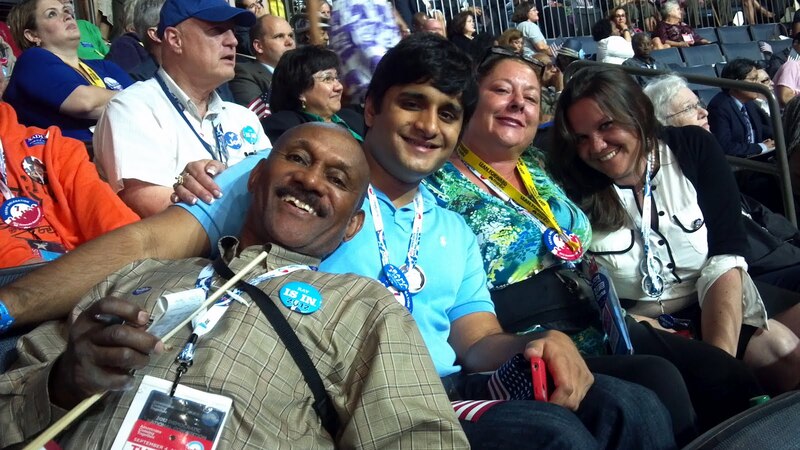 You can email us at info@collindems.net, or call (469) 713-2031 to leave a voice message.